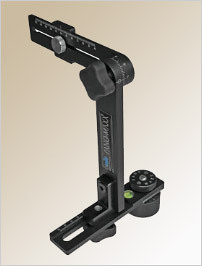 How to choose your panoramic head ? 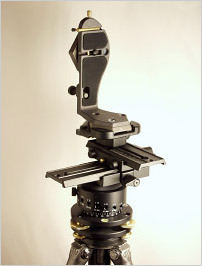 The model Manfrotto 303 L-Bracket is thus the cylindric model. It includes all you could expect from a panoramic head. 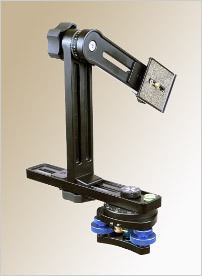 The rotary base is notched, all sliding stages can be dismounted, as well as the vertical arm, very robust. Dismounted in four parts, this model doesn't take much space in a photo bag. It is thus a reference head to realize monorange panoramas with top-range reflex cameras or middle-size cameras. The model 303 + (303 PLUS) differs from the model 303 by the micro-metric setting of its two sliding stages. But above all, because I find it a bit trivial, these stages are a bit longer than on model 303. It enables to have a little bit more of freedom to set it up, because with certain wide-angle zoom lenses, the entrance pupil is sometimes far from the camera and close to the front lens. The stages are too short then! Caution! This head can't be disassembled. * Nb of notches: 90°, 60°, 45°, 36°, 30°, 24°, 20°, 15°, 10°, 5°. There are two types of heads: cylindric VR-System and spherical VR-System Pro. They're particularly well manufactured - in the line of Arca Swiss for connoisseurs! They're adjustable and not to heavy but very stable because well-designed. And finally they're dismountable - except the vertical L-shaped arm -. 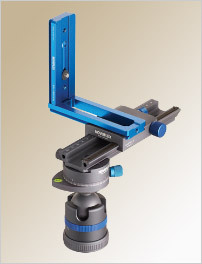 There are also several notched bases among which a top-range PANORAMA=Q PRO. Note: Novoflex equipment is hard to find in France. PANORAMA=Q PRO: 60°, 45°, 36°, 30°, 24°, 20°, 18°, 15°, 10°. The weight depends on the presence or not of a base. 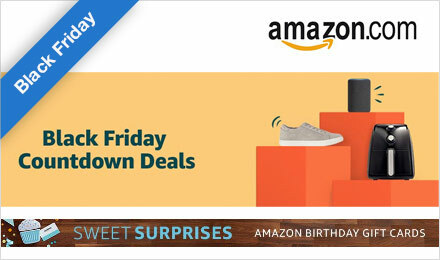 The price also depends on the base itself. 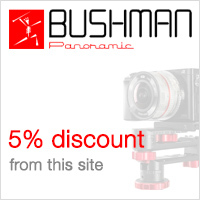 This new panoramic head Gobi by the company Bushman Panoramic possesses three obvious qualities at first sight: it is very well-manufactured - materials and finishing -, its is very light since it only weighs 320 grs and its is super-compact since it fits in the hand! It won't take much space in your photo bag or even your pocket. It is not the most stable on the market but this has no importance given its qualities... Pay attention to the length of the stages that won't enable you to place all your lenses at the entrance pupil though. Quick Click optional base: 90 °, 60 °, 45 °, 36 °, 30 °. 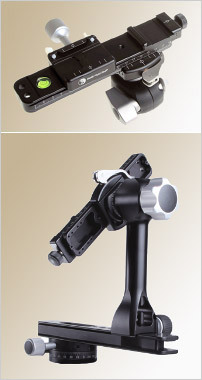 The model Manfrotto 303 SPH - is completely different from the two previous models. It's a spherical head. This head, quite heavy, still remains according to me a reference for big camera bodies like the EOS 1DS Mark III with a 50mm because of its robustness. I prefer to avoid mounting a wide-angle zoom lens open at 2.8 on it though! I often work with this head. Rather light, the heads Nodal Ninja 3 and 4 are spherical heads. The question of stability when you set a camera in overhang is thus asked. They're mostly dedicated to point-and-shoot cameras or to light reflex models like the Canon Eos 700 D, 70 D or 5D Mark III or even Nikon D7100 or D610. They're also especially not bulky and very well-designed. They really take few space in a photo bag. There are several notched rotators. Careful, the model with built-in leveling base isn't very stable. * RD-16: 90°, 60°, 45°, 36°, 30°, 24°, 20°, 18°, 15°, 12°, 10°, 7,5°, 5°, 3.75°. The weight really depends on the presence or not of a RD rotator. 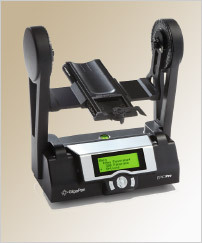 The price also changes depending on the model of rotator, RD-8 or RD-16. 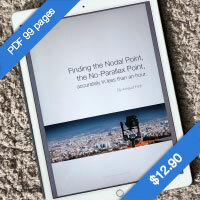 One of the cheapest panoramic heads on the market, the head Pano-Maxx is a spherical head. The question of stability when the camera is placed in overhang is thus asked, even more since it's rather light. It is mostly aimed at point-and-shoot cameras or light reflex models like the Canon Eos 760D, 80D or even Nikon D5200, D7200. It is also especially not bulky and well-designed. It really doesn't take much space in a photo bag. * several discs: 120°, 90°, 72°, 60°, 45°, 36°, 30°, 22.5 °, 20°, 18°, 15°. 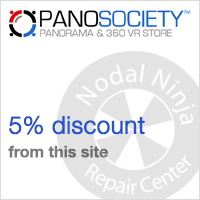 The panoramic heads 360Precision are spherical heads. They're very well-manufactured. Both heads 360precsion are aimed at rather light bodies for the model Adjust (1) and at all the rest for the model Absolute (2). The model Adjust has sliding stages. I notice that this head has been chosen a lot by my friend Eric Rougier - FromParis.com - and it's probably not a random choice. The modelAbsolute, as for itself, is tailor-made. 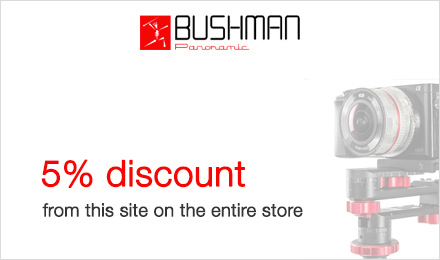 You thus need to place your order in accordance with the pair camera/lens used. It enables, I guess, to reinforce the overall stability since this model also suits big bodies and not having to look for the entrance pupil, but it's detrimental to the versatility you're expecting when you stitch monorange panoramas. The model Absolute is thus a tailor-made model that requires specification of the body model and the lens used when you place your order. 4-notches base: 90 °, 60 °, 45 °, 10°. 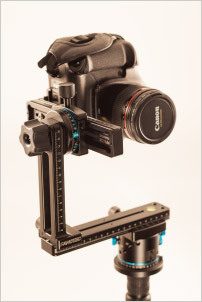 This new panoramic head by the company Cambo possesses two obvious qualities at first sight: it is wonderfully manufactured - materials and finishing - and it is very robust! At last a spherical panoramic head, indeed heavy, but very functional and on which you can mount almost anything. Excellent equipment! 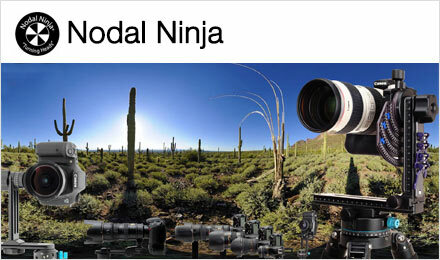 Very stable and amazingly manufactured, the Nodal Ninja Ultimate M-1 and M2 panoramic heads are manual spherical heads. 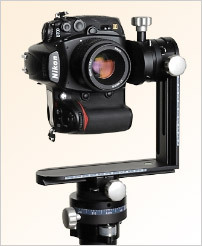 The M2 is another version of the M1, even more stable because it comes with two rotators even larger than those of the M1. 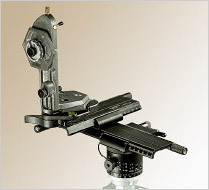 It is clearly made for gigapixel shootings because its main rotator's notches are very close together. Two universal heads, probably the best on the market! I now use a Ultimate M-2+ RD-8. ** RD-8: 30 °, 15 °, 6 °, 5 °, 4 °, 3 °, 2.5 °, 2° . Light because very compact, the heads Really Right Stuff look well-designed. It looks a lot like Arca Swiss. The Ultimate Pro version, spherical, can visibly handle effortlessly a body like a D300 or a Canon 5D and enables thanks to a clever L-shaped tailor-made plate, to place the camera horizontally and vertically. It is very convenient to shoot a vertical monorange panorama in addition to the more classic 360 ° × 180°. The vertical arm can also easily turn over on 180° to easily shoot the nadir. 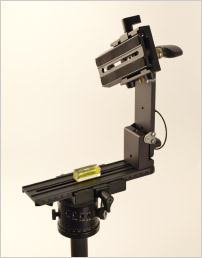 The L-Plate versions enable to mount a spherical head around any digital body, even a big one in a very crowded space hence without unbalancing overhang. Quick Click optional base: 90 °, 60 °, 45 °, 36 °, 30°. 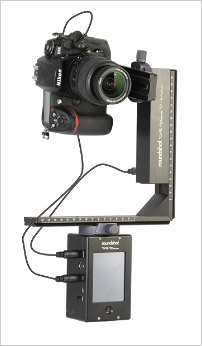 The motorized heads of the brand Gigapan are among the best value for money on the market. They're rather easy to use, very pleasant and above all very powerful. Remarkable tools. 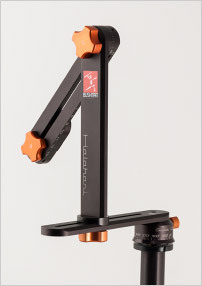 The model Epic Pro possesses two vertical arms for more stability. 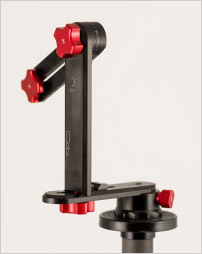 To set directly on a robust tripod. Nowadays, their main limitation is the lack of radio or bluetooth remote control. But I notice that the firmware is regularly updated and is now available in several languages! The motorized head VR Drive II by Roundshot is built on a Novoflex base, so you can imagine that irreproachable quality is here. One of the best motorized heads on the market is also the most expensive!